The Indiana General Assembly is the state legislature, or legislative branch, of the state of Indiana. It is a legislature that consists of a lower house, the Indiana House of Representatives, and an upper house. 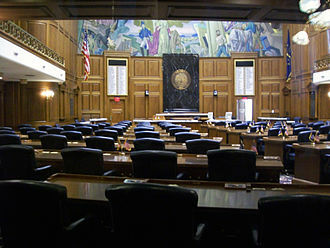 The General Assembly meets annually at the Indiana Statehouse in Indianapolis, members of the General Assembly are elected from districts that are realigned every ten years. Representatives serve terms of two years and senators serve terms of four years, both houses can create bills, but bills must pass both houses before it can be submitted to the governor and enacted into law. Currently the Republican Party holds supermajorities in both chambers of the General Assembly, Republicans outnumber Democrats in the Senate by a 40-10 margin, and in the House of Representatives by a 71-29 margin. 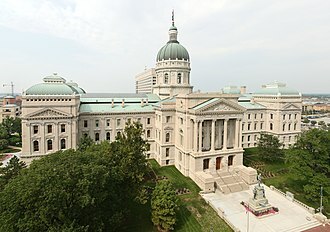 The Indiana General Assembly is made up of two houses, the House of Representatives and the Senate, Indiana has a part-time legislature that does not meet year-round. The General Assembly convenes on the first Tuesday after the first Monday in January, during odd-numbered years the legislature meets for 61 days and must be adjourned by April 30. During even-numbered years the legislature meets for 30 days and must be adjourned by March 15, the General Assembly may not adjourn for more than three days without a resolution approving adjournment being passed in both houses. The governor has the authority to call on the General Assembly to convene a special session if legislators are unable to complete necessary work within time allotted by the regular sessions. 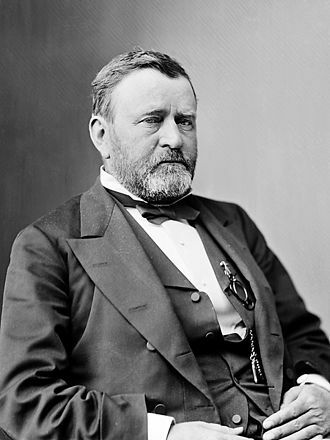 Special sessions of the General Assembly were rarely called in the early history. The General Assembly delegates are elected from districts, every ten years the districts are realigned by the General Assembly using information from the U. S. Census Bureau to ensure that each district is roughly equal in population. The districting is maintained to comply with the United States Supreme Court ruling in Reynolds v. Sims, the Indiana Senate and House of Representatives each have several committees that are charged with overseeing certain areas of the state. 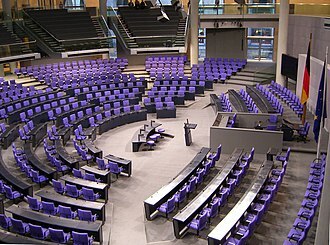 Committees vary in size, from three to eleven members, the committees are chaired by senior members of the majority party. The Governor of Indiana is the chief executive of the state of Indiana. The governor is elected to a term, and responsible for overseeing the day-to-day management of the functions of many agencies of the Indiana state government. The governor shares power with other executive officers, who manage other state government agencies. The governor works out of the Indiana Statehouse and holds official functions at the Indiana Governors Residence in the capital of Indianapolis. The 51st and current governor is Republican Eric Holcomb, the position of governor has developed over the course of two centuries. 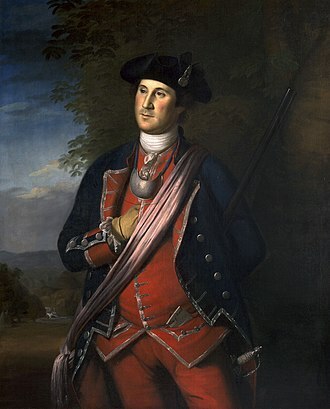 The governors powers are established in Article V of the Constitution of Indiana, the governor has very limited executive authority to manage the government of the state, most exercisable powers over state agencies are held by independent elected cabinet heads. The governor works in concert with the legislature and the state supreme court to govern the state. The governor has the power to veto legislation passed by the General Assembly, if vetoed, a bill is returned to the General Assembly for reconsideration. Unlike other states, most of which require a supermajority to override a veto. One of the governors most important political powers is the ability to call a session of the General Assembly. During a two-year period, the assembly can meet on its own for no more than 91 days, and this can give the governor considerable influence in the body which will often compromise on issues with him or her in exchange for a special legislative session. Among his other powers, the governor can call out the defense force or the Indiana National Guard in times of emergency or disaster. 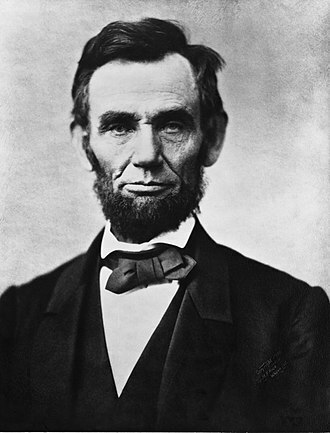 The governor is charged with the enforcement of all the states laws, the governor has the ability to grant a pardon or commutation of sentence of any person convicted of a crime in the state, except in cases of treason or impeachment. 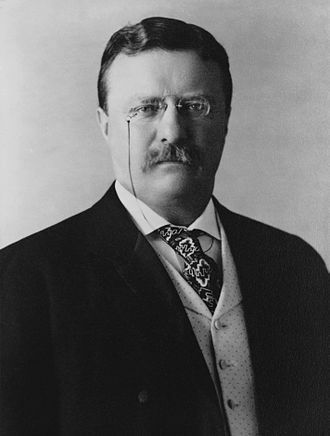 In addition to powers, governors have a considerable degree of statutory authority. Most of the authority exercised by governors on a basis is derived from statute. The governor can influence the court system through the appointment of judges. Eric Joseph Holcomb is an American politician who serves as the 51st and current Governor of Indiana since January 2017. Prior to his election to the governorship, he was the 51st Lieutenant Governor of Indiana under Governor Mike Pence, now the 48th and he was nominated to fill the remainder of Sue Ellspermanns term. Ellspermann resigned on March 2,2016, to become president of Ivy Tech Community College, Holcomb is a member of the Republican Party, and successfully ran for Governor of Indiana in the 2016 election against previous 2012 Democratic nominee John R. Gregg. Holcomb graduated from Pike High School in Indianapolis and Hanover College in Hanover, while at Hanover, he became a member of the Fraternity of Phi Gamma Delta, and served as Chapter President. 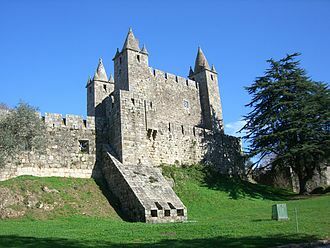 He served in the United States Navy for six years as an intelligence officer and he was stationed in Jacksonville, and in Lisbon, Portugal. He began working for John Hostettler, a member of the United States House of Representatives, in 2000, Holcomb ran for the Indiana House of Representatives against John Frenz, but was defeated by Frenz. The Hoosier State is an Amtrak passenger train that provides service on a 196-mile route between Chicago and Indianapolis. With the creation of Amtrak, riders were served by the South Wind, the National Limiteds discontinuance in 1979 severed Indianapolis from the national rail network, and isolated Amtraks Beech Grove Shops in the Indianapolis suburb of Beech Grove. The passenger carrier had been using the National Limited to ferry railroad cars to and from its shops, the Hoosier State entered service on October 1,1980. 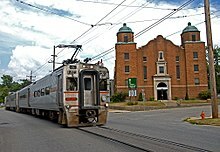 On April 27,1986, the Cardinal was rerouted to use the tracks as the Hoosier State between Chicago and Indianapolis, and began running on days the Cardinal did not operate. The Hoosier State was restored to operation on a separate schedule from the Cardinal on October 25,1987. But funding cuts led to its discontinuance on September 8,1995 while the Cardinal continued tri-weekly operation between Chicago and the East Coast, Amtrak restored the Hoosier State on July 19,1998, as a tri-, quad-weekly train. 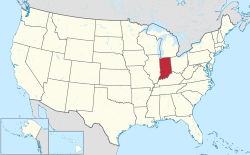 From December 17,1999, to July 4,2003, the Hoosier State was extended south from Indianapolis to Louisville, after the discontinuance of the Kentucky Cardinal, the Hoosier State returned to operating four days a week in tandem with the Cardinal. At a length of 196 mi, the Hoosier State was affected by this provision of PRIIA, operating costs above ticket revenue continue to be covered by the Indiana Department of Transportation and communities along the route. Planning was underway for the company to take over the service as early as October 1,2014, Corridor Capitol did not meet that deadline and Indiana Department of Transportation discontinued negotiations with the company in November 2014. Amtrak continued to operate the service under short-term contract extensions while the state considers alternative vendors. On March 6,2015, INDOT announced that the Hoosier State would discontinue service on April 1,2015. After Indiana appealed to the FRA, the operation was extended to April 30. 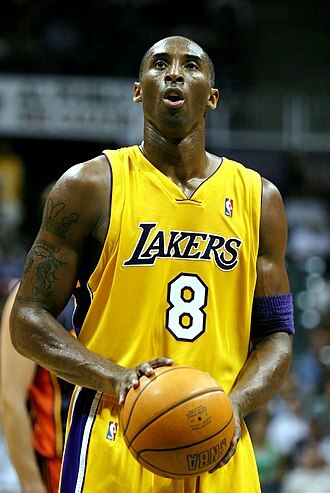 The contract had four option years. 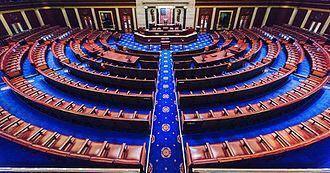 The Indiana House of Representatives is the lower house of the Indiana General Assembly, the state legislature of the United States state of Indiana. The House is composed of 100 members representing a number of constituent districts. House members serve two-year terms without term limits, according to the 2010 census, each State House district contains an average of 64,838 people. The House convenes at the Indiana Statehouse in Indianapolis, Representatives serve terms of two years, and there is no limit on the number of terms a representative may serve. 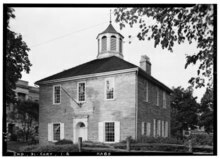 †Member was initially appointed to the seat, the Indiana House of Representatives held its first session in the first statehouse in the original state capital of Corydon and the first speaker of the body was Isaac Blackford. 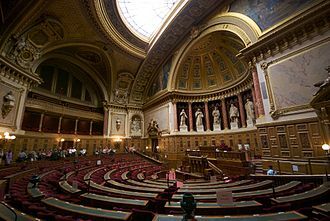 Under the terms of the constitution of 1816, state representatives served one years terms, in 1851, the constitution was replaced by the current constitution and terms were lengthened to two years, but sessions were held biennially. A1972 constitutional amendment allowed for a legislative session to be held in odd numbered years. 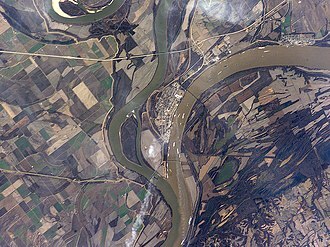 The Ohio River, which streams westward from Pittsburgh, Pennsylvania, to Cairo, Illinois, is the largest tributary, by volume, of the Mississippi River in the United States. 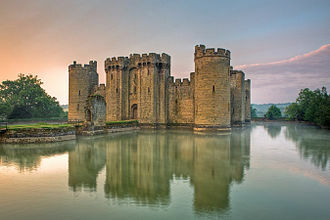 The 981-mile river flows through or along the border of six states, through its largest tributary, the Tennessee River, the basin includes many of the states of the southeastern U. S. It is the source of drinking water for three million people and it is named in Iroquoian or Seneca, Ohi, yó, lit. 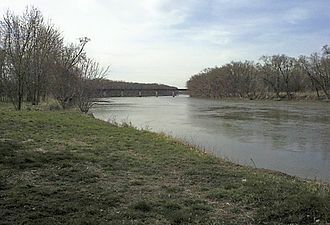 Good River or Shawnee and Spelewathiipi, the river had great significance in the history of the Native Americans, as numerous civilizations formed along its valley. For thousands of years, Native Americans used the river as a major transportation, in 1669, René-Robert Cavelier, Sieur de La Salle led a French expedition to the Ohio River, becoming the first Europeans to see it. 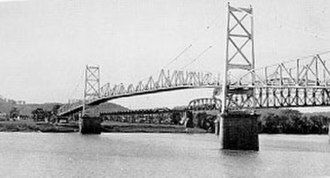 After European-American settlement, the served as a border between present-day Kentucky and Indian Territories. 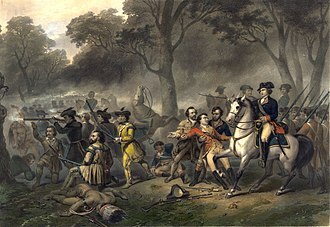 It was a transportation route for pioneers during the westward expansion of the early U. S.
In his Notes on the State of Virginia published in 1781–82, Thomas Jefferson stated and its current gentle, waters clear, and bosom smooth and unbroken by rocks and rapids, a single instance only excepted. During the 19th century, the river was the boundary of the Northwest Territory. Where the river was narrow, it was the way to freedom for thousands of slaves escaping to the North, many helped by free blacks and whites of the Underground Railroad resistance movement. The Ohio River is a transition area, as its water runs along the periphery of the humid subtropical. It is inhabited by fauna and flora of both climates, in winter, it regularly freezes over at Pittsburgh but rarely further south toward Cincinnati and Louisville. At Paducah, Kentucky, in the south, near the Ohios confluence with the Mississippi, Paducah was founded there because it is the northernmost ice-free reach of the Ohio. The Ohio River is formed by the confluence of the Allegheny and Monongahela rivers at Point State Park in Pittsburgh, from there, it flows northwest through Allegheny and Beaver counties, before making an abrupt turn to the south-southwest at the West Virginia–Ohio–Pennsylvania triple-state line. 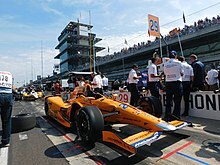 Indianapolis–Carmel–Anderson or Indianapolis metropolitan area is an 11-county metropolitan area in the U. S. state of Indiana, as defined by the Office of Management and Budget. 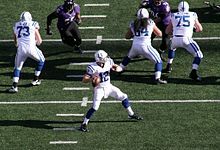 The metropolitan area is situated in Central Indiana, within the American Midwest, the metropolitan area is centered on the capital and most populous city of Indiana, Indianapolis. Indianapolis–Carmel–Anderson is the 34th most populous area in the United States. 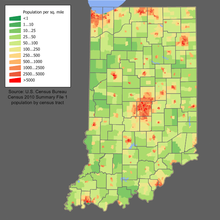 As of 2014, the population was 1,971,274, Indianapolis anchors the larger Indianapolis–Carmel–Muncie combined statistical area, the 26th most populated, with 2,372,570. The Indianapolis metropolitan area is part of the Great Lakes Megalopolis, the Indianapolis-Carmel-Muncie CSA had a population of 2,166,632 in 2014. The 317 area code covered all of northern and central Indiana until 1948, Central Indiana remained under the 317 banner until 1997, when growth in and around Indianapolis prompted the creation of 765 area code. The 317 area code covers the Indianapolis metropolitan area, the counties covered by 317 are Boone County, Hancock County, Hamilton County, Hendricks County, Johnson County, Madison County, Morgan County, and Shelby County. According to the Indiana Office of Utility Consumer Counselor, the 317 area code is expected to run out of numbers in 2017, overlay area code 463 will be implemented in late 2016, thereby requiring 10-digit dialing. Indianas Crossroads of America moniker is attributed to the historical function of the Indianapolis metropolitan area has played as a center for logistics. I-74 – Runs to Cincinnati, Ohio to the east and Peoria, other interstates that cross through the Indianapolis area include, I-465 – Also known as the USS Indianapolis Memorial Highway, I-465 is a beltway circling suburban Indianapolis. I-865 – It is an east–west connector northwest of Indianapolis in Boone County, meridian Street – A primary north-south route through Marion and Hamilton counties, the street serves as the axis separating east addresses from west addresses. 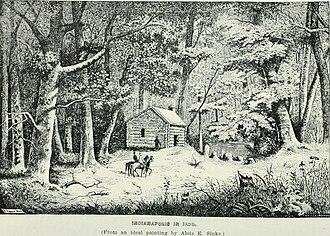 Michigan Road – Indianas first highway, built in the 1830s and 1840s, running north to Michigan City and south to Madison, sam Jones Expressway – Expressway between I-465 and I-70, connecting south-central Indianapolis with the former terminal of the Indianapolis International Airport. The flag of Indiana was designed by Paul Hadley and officially adopted by the state of Indiana on May 31,1917. It was the states first official flag and has remained unchanged since except for the creation of a statute to standardize the production of the flag, to commemorate the state’s 1916 centennial anniversary, the Indiana General Assembly issued a resolution to adopt a state flag. At the request of the General Assembly, a contest was sponsored by the Indiana Society of the Daughters of the American Revolution to design a flag to serve as the state banner. 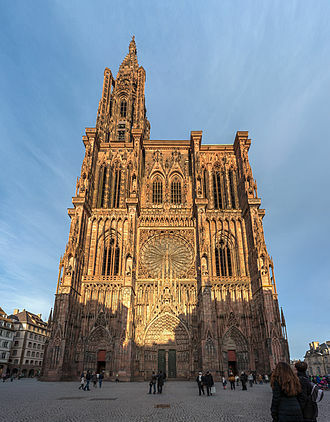 As an incentive to increase the number of submissions, the contest offered the winner a one hundred dollar cash prize, more than two hundred submissions were received and examined by the Society before a winner was selected. The entry created by Paul Hadley of Mooresville, was chosen as the winner of the contest. On May 31,1917, the flag was chosen as the official banner. 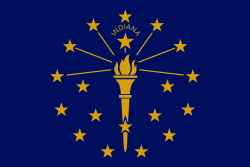 The General Assembly made only one change to Hadleys original design, they added the word Indiana, in a crescent shape, the state banner was renamed the states flag in a new statute passed in 1955 that standardized the dimensions of the flag. The flag consists of a torch that represents liberty and enlightenment. The nineteen stars represent Indianas place as the state to join the United States. 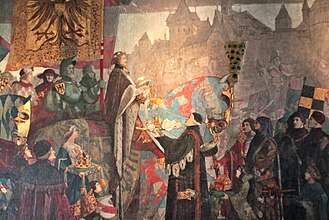 The field of the flag shall be blue with nineteen stars, rays shall be shown radiating from the torch to the three stars on each side of the star in the upper center of the circle. Several other laws govern the use of the state flag, the flag is required to be flown by all state militias and the Indiana National Guard. 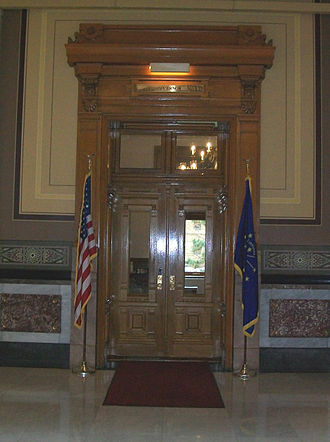 It is to be on display at the Indiana Statehouse at all times, the flag must be displayed at any agency that is funded in part or in full by the state government, including public schools, state universities, and state parks. In all other respects the flag should be treated with the same care, in late 2008, Tribune Media station WTTV in Indianapolis began to use the flags design as part of their stations logo until acquiring CBS affiliation in January 2015. A variation of the Indiana state flag was used as the Gotham flag in the 1989 movie Batman, the flag can be seen in the mayors office. The Seal of the State of Indiana is used by the Governor of Indiana to certify official documents. The seal has gone through several revisions since the region was a part of the Northwest Territory and it is likely the original seal, which is similar to the current one, was created by William Henry Harrison during his administration of the Indiana Territory. The current design of the seal was standardized by the Indiana General Assembly in 1963, the state seal is maintained by the Governor of Indiana. It is used to certify the authenticity of official state documents, the seal is placed on departmental reports, bills the Governor signs into law, and official communications from the Governor to other high-ranking office holders. The seal is used on all commissions granted by the state as proof of the commissions authority. 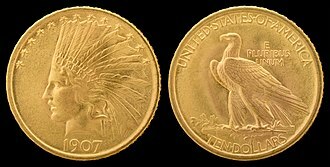 The United States Congress passed legislation on May 8,1792, Indiana was part of the Northwest Territory at that time and a seal was created by the United States Department of State to be used on official papers of the territory. The original seal was maintained by Governor Arthur St. Clair, on May 10,1800, the Indiana Territory was created by an act of Congress, but no provision for an official seal was included in the measure. 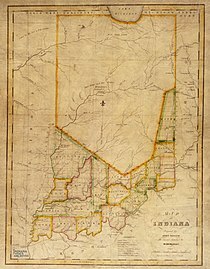 The earliest recorded use of Indiana Territorys seal was on court documents that were signed by Governor William Henry Harrison in January 1801, the seal he used was an adaptation of the original seal created for the Northwest Territory. Although its origin is uncertain, it is likely that it was Harrison who made the alterations, the constitution of 1816 contained a clause that stated the governor should maintain a state seal and use it in official communication. The design of the seal was first proposed during the first session of the Indiana General Assembly in 1816, the bill was put through a joint conference of both houses of the General Assembly and funds where voted to purchase a printer to create the seal. In 1819, the seal was part of a state crisis. 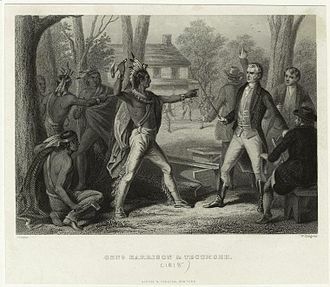 Lieutenant Governor Christopher Harrison became acting-governor when Governor Jonathan Jennings was away conducting negotiations with northern Indianas native tribes, when Jennings returned, Harrison refused to step down as governor, claiming that Jennings actions had invalidated his governorship. 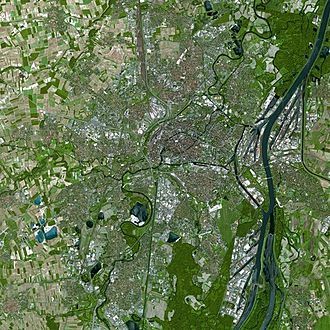 Satellite image of the Indianapolis metropolitan area (2001). Indianapolis International Airport's Col. H. Weir Cook Terminal (pictured) opened in 2008 after a $1.1 billion expansion. Indiana University – Purdue University Indianapolis enrolls some 30,000 students, the highest post-secondary enrollment within the Indianapolis metropolitan area. Hinkle Fieldhouse is home to the Butler Bulldogs. 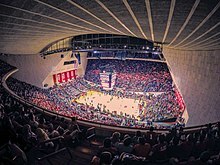 In 1954, Hinkle hosted the "Milan Miracle," inspiring the 1986 film Hoosiers. 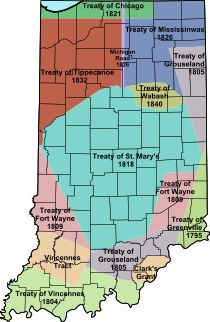 Anthony Wayne concludes peace with the Northwestern Indian Confederacy in the Treaty of Greenville. The motto was included on Indiana's state quarter.